The Lempert Report with Phil Lempert is designed specifically for the B2B Food World with a focus on Marketing Analysis, Issues & Trends and now includes a news report from The Food Institute in every Thursday’s episode. For more than 25 years, Lempert, an expert analyst on consumer behavior, marketing trends, new products and the changing retail landscape, has identified and explained the impending trends. New episodes of "The Lempert Report" are uploaded every Tuesday and Thursday mornings, along with appropriate downloads and links. To contact Phil Lempert, please send an email to: phil@supermarketguru.com. The leaders in global strategic business summits specifically catered to the growing Food Industry. Offering high caliber one to one pre-scheduled focused private meetings, along with world class cutting edge conference programs, master classes, thought leader seminars, round table discussions, and Executive networking functions. IFDA's members operate more than 700 distribution facilities and represent annual sales of more than $110 billion. These companies help make the food away from home industry possible, delivering food and other related products to restaurants and institutions - from the local pizzeria or burger shop to your favorite Italian restaurant or white tablecloth establishment, from nursing homes and hospitals to military mess halls and school cafeterias. The IGA Coca-Cola Institute is a people development organization founded by IGA (Independent Grocers Alliance) with the support of The Coca-Cola Company. 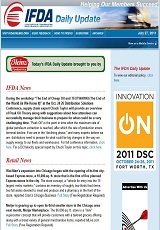 For the last 20 years, the Institute has been dedicated to providing learning resources for food retailers worldwide. As an educational organization, it serves more than 5,000 businesses with blended training programs that include more than 85 industry-specific online courses divided into eight different libraries. The Institute also provides non-IGA retailers and associations with their own branded online corporate universities. The Institute has one of the world’s largest online food industry course catalogues. In 2011, it had more than 300,000 enrollments and offered learning opportunities in six languages: English, Chinese, Spanish, Portuguese, Polish, and Russian. The Institute has seen an average annual growth of 200% over the last five years. Click here for more information about the Institute.